On clearer days, I could see far beyond the trees on the opposite bank of the river, a pale outline of hills visible against the clouds. 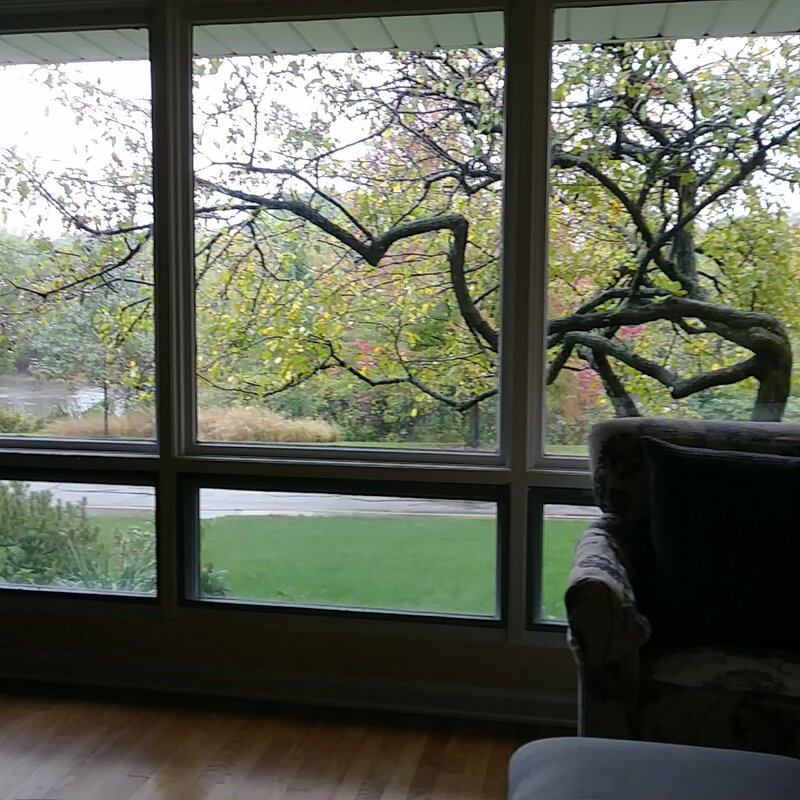 It was not an unpleasant view, and on occasions it brought me a rare sense of relief from the emptiness of those long afternoons I spent in that apartment. It seems a perfect day to be reading such a book, A Pale View of Hills, with the pale view outside of my own front window. The atmosphere within my living room contributes to the atmosphere Kazuo Ishiguro has created, one of mystery and sorrow. One of nostalgia and regret. The English are fond of their idea that our race (Japanese) has an instinct for suicide, as if further explanations are unnecessary; for that was all they reported, that she was Japanese and that she had hung herself in her room. Etsuko has lost her eldest daughter to suicide, and at first that is what I thought the novel was going to be about. But, it is really Etsuko’s reminiscences about the past, about her friend who lived in a small cottage in Nagasaki with her daughter, Mariko. Sachiko is a mysterious woman. She laughingly avoids direct questions, she seems unperturbed by the way that her daughter disappears, or that her daughter is able to visit with a woman whom no one else can see. She lets Mariko stay out after dark for long hours, far longer than I could ever have allowed, and in the end, breaks her promise to Mariko about keeping her little kittens. In Sachiko’s mind, the small, dirty animals could never come to their new home, following an American man who will become the new husband, the new father. It doesn’t matter how old someone is, it’s what they’ve experienced that counts. She asserts that her daughter, Mariko, will be fine in America. It’s a better place for a child to grow up. And she’ll have far more opportunities there; life’s much better for a woman in America. But perhaps this is what she tells herself, in trying to believe that she is doing the right thing in leaving Japan. Parts of the novel refer to the old way of life in Japan, when the elders taught respect, when women followed their husband’s wishes. Ishiguro points to the loudness of Americans in their big cars, a point I feel acutely myself, and even the English way of life is brought in for contrast. In Japanese cities, much more so than in England, the restaurant owners, the teahouse proprietors, the shopkeepers all seem to will the darkness to fall; long before the daylight has faded, lanterns appear in the windows, lighted signs above doorways. Ultimately we close the book, turning the last page, without much knowledge of Etsuko’s daughter or her death. In fact, one can’t help wondering if this daugher, Keiko, and Mariko are so similar they could be the same girl. Surely when Etsuko was talking to Mariko she promised her, that if things were terrible, they could return. Is Etsuko confusing the events of her life? Or, is her memory rearranges things to make them more palatable? This is a lovely novel, a brief and atmospheric story of a mother’s love for her child; a mother’s hopes for the future while turning over the past in her mind. Have you read it? Do you have another interpretation? Please tell me in a comment below, and let me know if you have a review to which I can link. 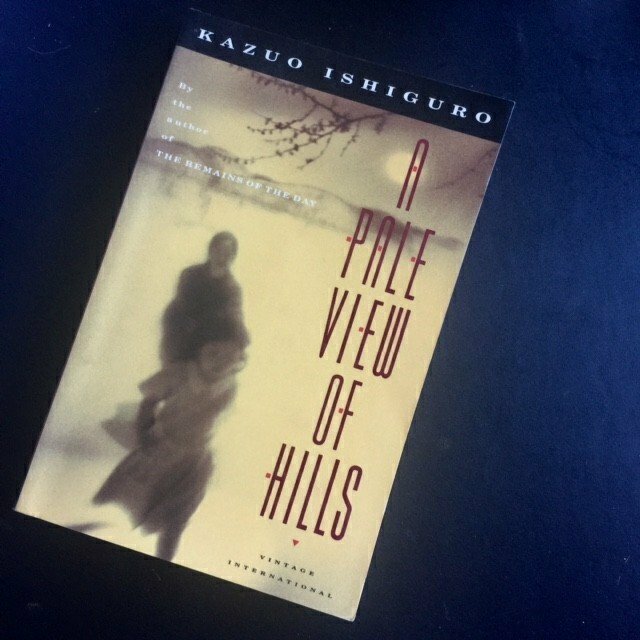 I read it for the Japanese Literature Challenge 11, but also to think of Kazuo Ishiguro as he received the Nobel Prize for Literature last week. Find another review from BookManiac here. How about a read-along for Kazuo Ishiguro? I found it so exciting when Kazuo Ishiguro was determined the winner of the Nobel Prize for Literature this week! So many recipients of previous awards the last few years (Man Booker, I’m looking at you) have not only been surprising to me, they have been utterly disappointing. Would any of you like to read one of these with me? (None of the three are more than 280 pages.) We could take our time, casually reading and discussing through what remains of October. Let me know what you think, for I would rather read with you than alone. Update: It seems that some of us will read two: A Pale View of Hills and Remains of the Day. I think we should take October to read which we like, some even prefer Never Let Me Go, and at the end of the month I will host a round up. At that point, I will pose a few questions for us to discuss and post any links to your reviews. I didn’t come to Tokyo for the upscale shopping or all the great places to have fun at. What I wanted was to melt into the crowds of people who didn’t know about my past, and vanish. Each chapter of this novel is told from another character’s point of view, all circling around one central theme: the murder of Emily, whose father was an executive with Adachi Manufacturing. The company had come to their obscure little town because the quality of air was exceptionally clean and pure, a point which is repeatedly brought up, yet in stark contrast to the story each girl has to tell. As children, they were playing volleyball in the schoolyard after hours when a man appears, dressed in workman’s clothes, telling them he needs to fix the ventilation fans in the school. He chooses Emily to help him, and when she is gone for a long time her friends enter the school to find her dead on the floor of the men’s washroom. What a thing for an adult to say to children! These girls have been traumatized for the rest of their lives, reliving every moment of this horrendous situation, each wondering what they could have done differently. They are unable to trust, even themselves, let alone the adults around them. Everything in their young lives is called into question. There is one thing, however, that is not a form of penance: killing a different man in place of the murderer. As each of the girls comes to find out. The only form of penance which has any positive effect whatsoever, is forgiveness. And, maybe, the person who needs to be forgiven the most is ourselves. I read this book for my own Japanese Literature Challenge 11, and also for Women in Translation Month hosted by Biblibio. From the very beginning we are presented with tension between children and their teacher. From the very beginning we know why she is talking to her class about this year being her last. The teacher’s daughter, Manami, has been found floating in a swimming pool, and after a brief explanation she tells us at whose hands her daughter has died. And then, before dismissing the class, she reveals a terrible act of revenge on her part toward the two students who killed her child. Through each subsequent chapter, confessions are revealed through the eyes of a classmate, one of the murderer’s mothers, and even the murderers themselves. The confessions are shocking and appalling, but the whole tone of the book is one of quiet resignation. It is almost as though each tragic event is a matter of fate, and must simply be lived out. It is, as my father has often said, like watching a slow motion horror film. For perhaps worse than the confessions are the hearts of each character, for what they are willing to do instead of forgive. Or, even love. I read this fascinating novel after reading the review on su[shu], and now I’m glad to know of another excellent Japanese writer for the Japanese Literature Challenge 11. But, it isn’t obvious at all. At first. Ryder has come to an unnamed European city and is welcomed to the hotel by no one. They had all given up waiting for him, as he is so late, and he doesn’t even remember viewing the schedule for the series of events in which he will be expected to appear. It seems he is a pianist of some reknown, and that he will give a much anticipated performance. However, there is a great deal he needs to sort out first. Everyone is asking something of him. The porter, Gustav, wishes him to meet with his estranged daughter, Sophie, to see what is wrong, but when Ryder goes to the cafe where she will be it is evident they know each other already. They even have no small degree of anger and frustration between themselves. How can this be? We realize that this is a dream (with many qualities of a nightmare), or an alternate reality, or at the very least some degree of amnesia on Ryder’s part. This mystical quality is exactly what I love most about Japanese literature. I read on with trepidation, feeling the same sensations I do when I experience an unresolved dream sequence of my own. Do you recall a terrible struggle to get some place to which you can never arrive, or do something that you somehow can no longer do? I think of trying to run when my feet feel mired in clay. I think of dreams I’ve had appearing in my classroom for the first day, woefully ill prepared, or worse, undressed. Each page holds some element like that. One small example is this: Ryder follows a little red car to lead him to the Karwinsky Gallery, but stops en route at his wife’s urging at a pastry shop where his son enjoys the doughnuts. There is a sense of urgency about him arriving at the reception in the gallery, he is already late, and yet here they are looking at delicacies through the glass case. When he arrives st the gallery he sees the ruins of his family’s car, from when he was a child, and he climbs in remembering the times he played in it. Gradually, we learn of more and more distress in his life, from his unhappy marriage to his mother’s emotional instability, and we wonder how any of this will be resolved. Perhaps, the very journey through these pages is a working out of his life. Yet, Ryder’s life is not the only one full of unconsolations. Gustav, the porter with an indomitable will, weakens and lies inert backstage on a cot; Brodsky, the conductor, must face his alcoholism and longings for his ex-wife, Miss Collins; Miss Collins, a psychologist, loves Brodsky but is reluctant to become entangled in his issues yet again; Ryder and Sophie seem unable to arrive at a peaceful relationship for long, much to the distress of themselves and their son, Boris. This is a beautiful novel, elegantly told, which speaks to the complications and heartache in life of which I am so fond of reading. It is my first book for the Japanese Literature Challenge 11, and one I highly recommend. Japanese Literature Challenge 11: Welcome! And, Europa Editions has just published The Nakano Gift Shop by Hiromi Kawakami this June. So, I hope you will join us again this year, or perhaps for the first time. The challenge runs from June through January, “requiring” only one work (or more, if you choose) which has been originally written in Japanese. I have placed a challenge button on the bottom of my blog under which I will list the participants, as well as the titles and links to reviews you have read. I will also post updates every month highlighting the books we read. Please be sure to let me know in a comment below if you would like to participate, and/or when you have a book reviewed. I’m looking forward to this time together!